A musical journey awaits, nestled in the majestic rocky mountains June 20 – August 4, 2019. Join in a voyage of transcendence and discovery through Bravo! 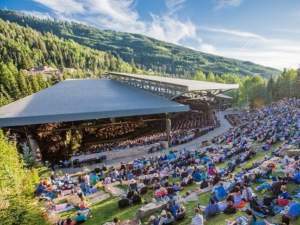 Vail’s electrifying 2019 summer season. Experience the Chamber Orchestra Vienna – Berlin—a unique collaboration of two of the world’s most prestigious ensembles—in its North American debut, and a revolutionary immersive production of Puccini’s Tosca with The Philadelphia Orchestra, the first staged opera in Bravo’s history. The Dallas Symphony Orchestra and the New York Philharmonic return, offering truly extraordinary performances of classical masterworks and popular favorites, together with renowned guest artists from around the world. Continue the journey with intimate chamber artistry, family-friendly fun, and illuminating educational programs, all in gorgeous settings and unique venues throughout the Vail Valley. Savor the celebration of music, nature, and community that is Bravo! Vail. Hailed as one of the Top 15 Classical Music Festivals in 2017 & 2018 by The New York Times.